Late July in the Pacific Northwest can only mean one thing: blackberries! Few things are as satisfying as grabbing a bowl and just walking along the street in my neighborhood (or really anywhere in the Northwest) and grabbing berries until my fingers are blue. Usually, I'll take Rye for a dip in Lake Washington at Magnuson Park and while he dries off, I will pick blackberries in the park. An hour later, I'll find him semi-dry with twigs and thorns stuck in his coat and splatters of black and blue all over his mouth. He knows what's up. As summer has finally arrived in Seattle and we're currently in a very hot stretch, I'm still electing not to turn on my oven, so back to ice creams and maybe popsicles. Though, since I keep throwing very overripe bananas into my freezer, it's looking increasingly likely that banana bread will have to made sometime this week, if only to give my freezer a little breathing room for more ice creams and popsicles. I also recently caved and bought a big box of waffle cones from Trader Joe's, so lots of ice cream is definitely in my immediate future. Word to the wise, as with all things that you forage or grow yourself, sometimes you get a bit more than you bargained for. 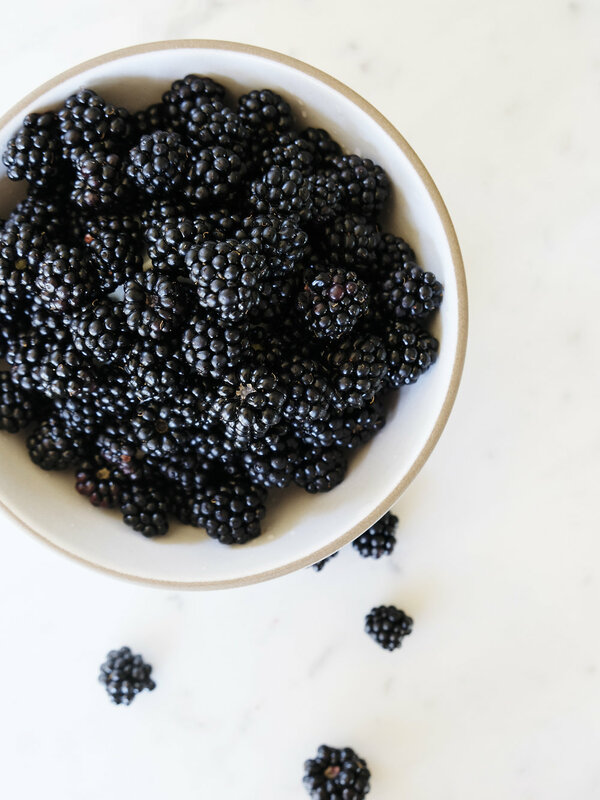 Elect to pick blackberries on side streets, in your backyard, at farms, or in nature for lack of a better term, rather than alongside busy arterials and freeways. I'd rather my berries not be exposed to car exhaust, pesticides and the like. Also, do pick over your berries for bugs and thoroughly wash a few times right before using, floating them in a bowl of water can help you pick out any errant tagalongs. If your blackberries are a bit tart, add an extra tablespoon or two of sugar. I love biting into blackberry seeds, so after straining the cooked blackberries, I usually elect to add back in a few spoonfuls of the strained seeds. Make the ice cream: place the cream, milk, salt, and 1/2 cup sugar in a small saucepan. Cook over medium heat, uncovered until just beginning to boil, whisking constantly to dissolve the sugar. Pour into a shallow bowl, cover with plastic wrap and place in refrigerator to chill completely, about 1 hour. Meanwhile, make swirl: combine blackberries with remaining sugar and tablespoon of water in a small saucepan and cook over medium heat. In a separate small bowl, mix cornstarch with lemon juice. Stir and mash berries until very soft and cook for about four minutes, until berries are very soft and have released their juices. Add in lemon juice mixture. Cook until mixture is thick and coats the back of a spoon, another 30 seconds. Strain mixture through a sieve into a clean bowl and chill. Add in a pinch of salt and lemon zest. Add back in a spoon or two of the strained blackberry seeds if desired. When the mixture is cold, add in vanilla extract. Pour into an ice cream maker and process according to manufacturer’s instructions. 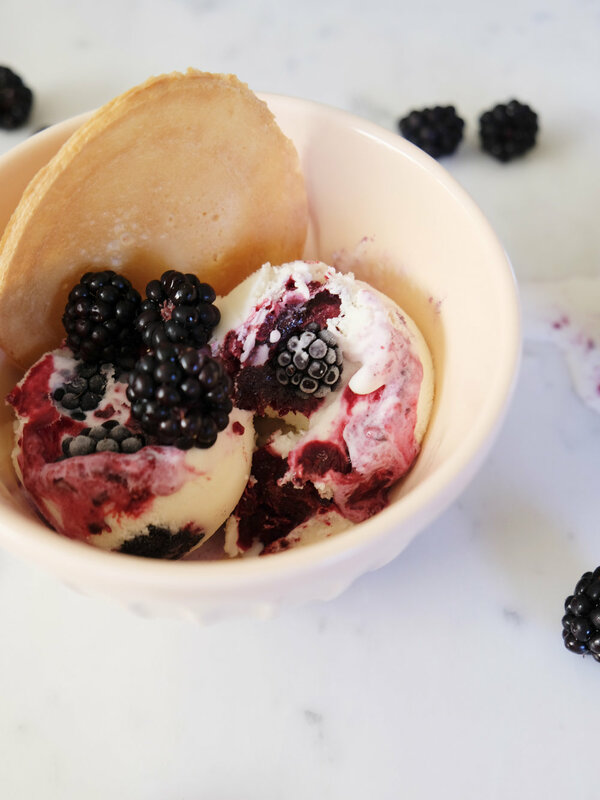 As you remove ice cream base from the machine, layer it in the container with spoonfuls of the cooked blackberry mixture. Cover tightly and freeze until ice cream is firm, four hours, and serve.